With the huge number of folk dance recordings now available on CD or for download as ".mp3" files, trying to restore recordings that were issued as 78 revolutions per minute (rpm) discs may seem rather esoteric. However, there is some good music in this format and, as all 78s were issued before 1963, the records are out of copyright, an extemely useful attribute! Unfortunately the equipment needed to play such records can be problematic and the noise level is too high for routine use. Although 78rpm records can be replayed and digitised at 45rpm (or even 33rpm) and then speeded-up using facilities in software such as GoldWave or Audacity, it is quicker to perform the playback and easier to monitor using a deck that can run at 78rpm. 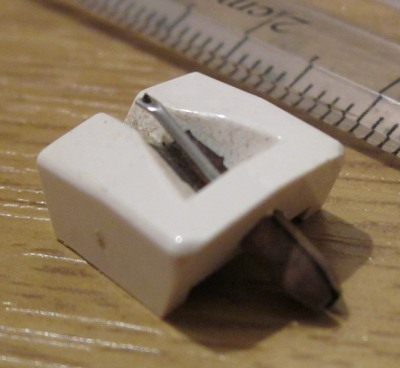 The next problem is that the stylus for microgroove records fitted to almost all record decks has a tip with a radius that is too small for the larger grooves on 78 records. A microgroove stylus can sometimes give usable results, but the noise levels may be even higher as it penetrates the debris that has collected in the bottom of the groove. In addition, it is apparently possible that the larger stylus movements caused by a 78 record can damage a microgrove stylus and cartridge. 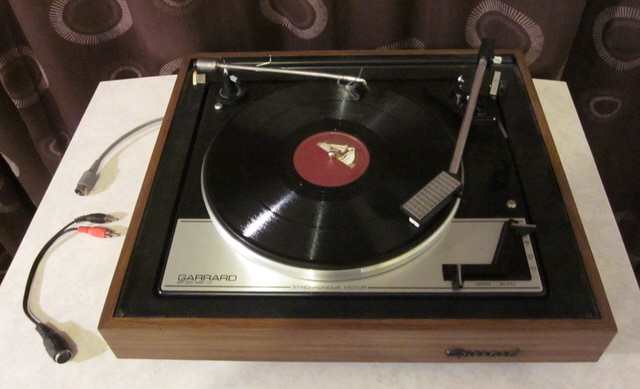 I am fortunate in having access to a Garrard SP25 Mark IV turntable, retained by John Riley, which can run at 78rpm (note that the later SP25 Mark V does not) and is fitted with a Goldring G800 cartridge. This cartridge has a removable stylus, and a new stylus suitable for 78 records is still available, for example from Mantra-audio. I have found that playing 78 records requires a higher tracking force, 4 grammes or more, than I use for a microgroove stylus. 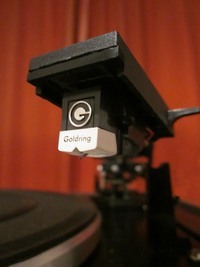 Anything less and the cartridge output is low and some lead-in grooves are not followed. Using such a turntable and cartridge also requires an amplifier that has a "phono" input, as the signal levels are too small for digitisers which require signals at "line" levels. I use a harman/kardom HK6100 which feeds into the xitel INport digitiser that I also use for analogue magnetic tape recordings as already described. Arranging proper earthing and grounding of the turntable deck and the amplifier is vital. If this is not done there can be a high level of mains hum. Most amplifiers have a GROUND connection on their rear plate which can be connected to a grounding point on the turntable deck, or, if the deck has no such labelled connection, then to exposed metal on the deck. 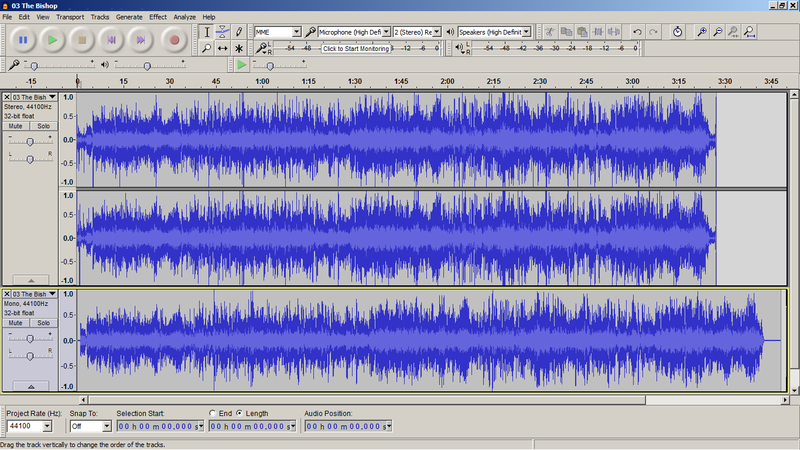 Here are two examples of digital tracks as recovered from 78rpm records. The first has quite a low level of noise, but still has the distinctive "crackle" of 78rpm records that are made from shellac (a hard natural substance produced by insects). 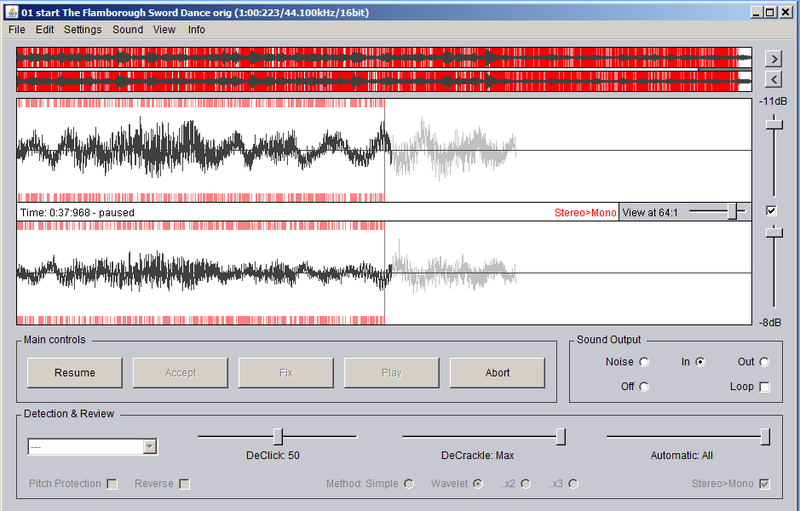 The second example, as well as the crackle, has quite a high level of other noise. The digitised tracks are stored on a computer in an uncompressed format, I use ".wav" files, but these have been compressed to ".mp3" files for inclusion in this web page. These recordings, as they come from a stereo cartridge and are captured through an amplifier & digitiser that deal with stereo, are stereo whereas 78rpm records are mono. The reduction to mono will be dealt with as part of the following data processing. 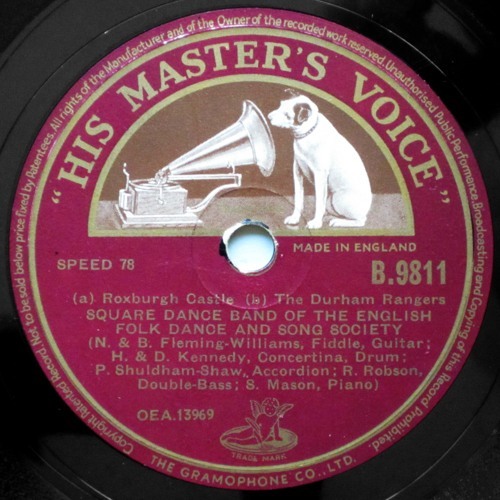 Although the first example is from a record issued by HMV and the second by Columbia, the noise level is in general not a characteristic of records issued by particular companies. High noise levels and distortion is much more likley to be the result of mishandling of a record or playing on poor equipment. As another example, I have one 78 record where all the high volume notes have noticable distortion. Another copy of the same record from a different collection does not have this distortion, so the distortion has been introduced by the equipment used to play it at some point. Several other records from the same collection unfortunately have similar distortion. Red vertical marks | show where a correction is applied. 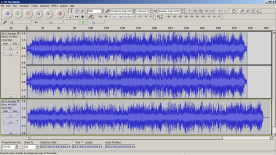 Although the standard noise reduction facilities in software such as Audacity or Goldwave can be applied, and may work fairly well on records with a low noise level like the first example above, there are better software tools which cause less distortion. ClickRepair will, as its name suggests remove "clicks" from any digitised gramophone recording (such as those caused by scratches on the record), but also does an excellent job of removing crackle from 78rpm recordings. In addition, ClickRepair can make best use of the information present in a stereo digitisation of a 78 record to produce a mono version. All the following ".mp3" files for examples 1 & 2 are mono (while the above two examples were stereo); this halves the size of files. It should be noted that audio CDs do not have a mono mode, so any tracks that are eventually written to CD have to have identical left and right channels written to the CD-R. Here are the same two examples after applying ClickRepair with its "Default 78" settings; these settings include stereo→mono. ClickRepair identifies and removes each individual "spike" in the digitised time history whether these be large (for example a click from a scratch on the record), or small (such as a single occurence making up the crackle). As you can hear in the above examples, it does a really superb job! However, even the first of the preceeding examples still has surface noise. This sounds very similar to that heard on micro-grove records (that is 33rpm LPs and 45rpm records). This noise can be heard in the first of the above examples (after the application of ClickRepair) particularly in quiet passages or before the start of the track. A much greater level of noise remains in the early part of the second example. Such noise can be reduced considerably using the same software tools as are used to remove "tape hiss" and mains hum from analogue magnetic tape recordings. An explanation of this is given in one of the sections on audio processing. 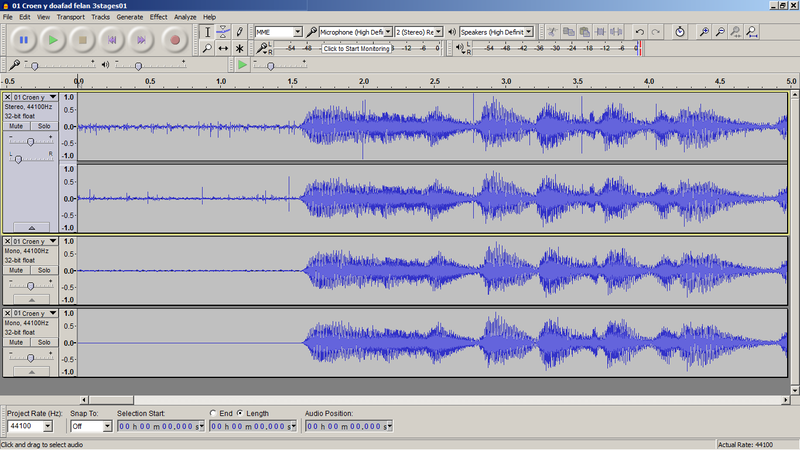 That section explains the process using Goldwave, but very similar facilities are available in Audacity. Here are the same two examples after also applying the noise reduction facility in Goldwave. Except for early gramophone records (which were intended to be be replayed using mechanical rather than electrical sound reproduction systems), the signal recorded on gramophone records have the amplitude of low freqency sounds reduced and/or the amplitude of high frequency sounds increased. Correcting for this during replay is called "equalization". In the mid-1950s a standard was adopted by most companies in Western countries; this is known as RIAA equalization (Recording Industry Association of America). It is used on all 33rpm and 45rpm records issued in the West after the mid-1950s. Electical circuitry in record players and the phono input of amplifiers has this equalization built in. Unfortunately, prior to the mid-1950s each record company tended to apply its own equalization. Some companies that produced 78 records changed the equalization that they applied as technology and knowledge advanced; some companies changed more than once. We therfore have to remove the RIAA equalization that has been applied during replay and, except for acoutic (that is mechanically recorded) discs, apply a more appropriate equalization. To avoid uneccesary stages it is best to combine these operations, and because the choice of equalization characteristics can become subjective, I prefer to do this after removing crackle and surface noise. 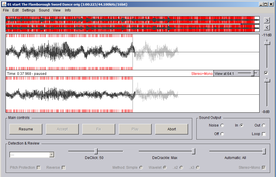 A free software tool, Equalizer, is available from the same source as ClickRepair; this comes with a library of equalizations suitable for 78 records from a number of companies. 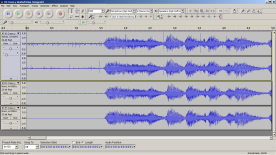 Audacity provides a similar facility with a (different) library of equalizations. Dealing with the first example, which is a HMV record, there is nothing for HMV in the Equalizer library. The article Legacy Recordings EQ gives equalization characteristics that have been identified for many record companies and, where necessary, for several eras. Unfortunately hardly any of the labels on 78 records have a date; presumably this is to allow them to argue about when their copyright runs out! For HMV, the article gives characteristics for four different blocks of years; the one for 1946-1954 seems the most likely to apply to this recording. However, it gives two different possible characteristics, with low frequency 'turnover' at either 500Hz or 800Hz. So now we have to fall back on the human ear to decide which to use. 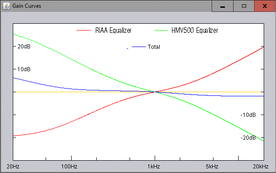 Both can be implemented as custom equalizers in the Equalizer software; I called them HMV500 and HMV800. Applying both to example 1 and listening to the results, I preferred HMV500. HMV800 attenuated the high frequency content more so the percussion instrument became almost inaudible. 1. Croen y doafad felan with RIAA equalization removed & HMV500 applied. The graph on the left shows the resulting amplifications and attenuations that are applied over the frequency range 20Hz to 20,000Hz. Only for very low frequency notes below 100Hz are there any large changes; there is significant amplification if any sound is found at such a low pitch. High pitched sounds are slightly attenuated. 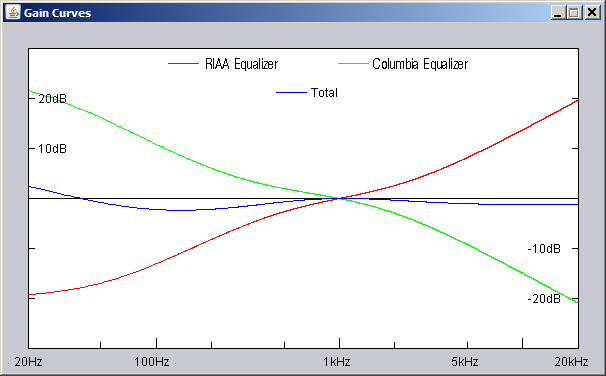 For the second of the above examples, which is from a record issued by Columbia, there is a filter in the Equalizer library, see graph on left. However, the article Legacy Recordings EQ that has already been mentioned gives five different sets of equalization characteristics that have been applied by Columbia. The one provided in the Equalizer library seems to be that for the "1938-most" series rather than that for the "European" series. However. I was satisfied when I listened to the results of applying this equalization to the second example and to other Columbia recordings. 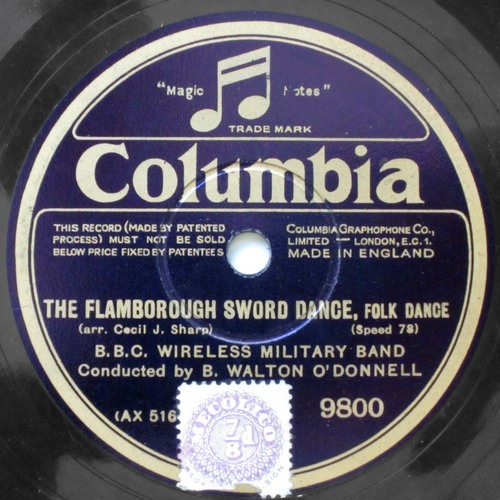 2. start of The Flamborough Sword Dance with RIAA equalization removed & Columbia applied. It will be seen that the difference between the RIAA and Columbia equalization curves is not large; the required correction reduces high frequency content of the sound slightly and also reduces low frequency content a little, except at extremely low frequencies. A useful step at this stage is to amplify the digital signal to peak at +1.0 or -1.0. 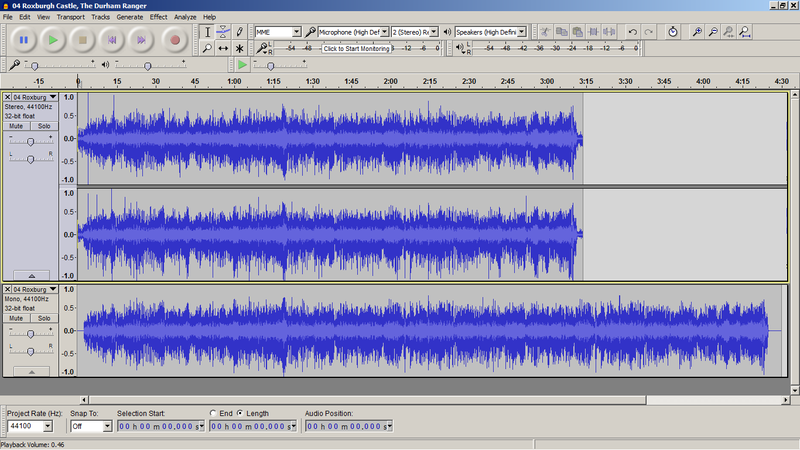 Both Goldwave and Audacity provide a simple facility to do this. It should be noted that in some recordings the leading chord played before the start of the music can be the loudest. To avoid having to limit the volume of the remaining music it may be necessary to reduce the relative amplitude of this chord. Having improved the sound quality of 78rpm recordings, attempting to use many of them with current (early 21st century) dancers raises another issue. The tempo at which the music is performed is often faster, sometimes very much faster, than is now customary or even acceptable. 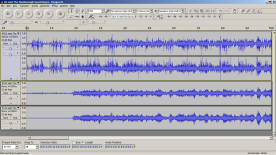 Fortunately there are tools in audio processing software, including both Audacity and Goldwave, which can change the tempo without altering the pitch of the music. Here is an example where the original recording issued by Columbia is played at 136 beats per minute (bpm). The revised version has been slowed to 124bpm, which is still considered to be quite fast for dancing 'The Bishop', and so retains some of the 'urgency' of the original. 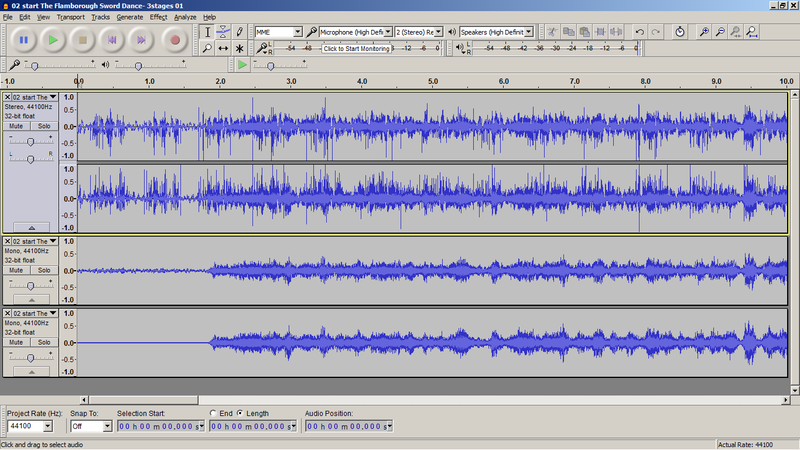 ClickRepair, Goldwave noise reduction, and Equalizer have been applied before using "Effect" → "Change Tempo" in Audacity. 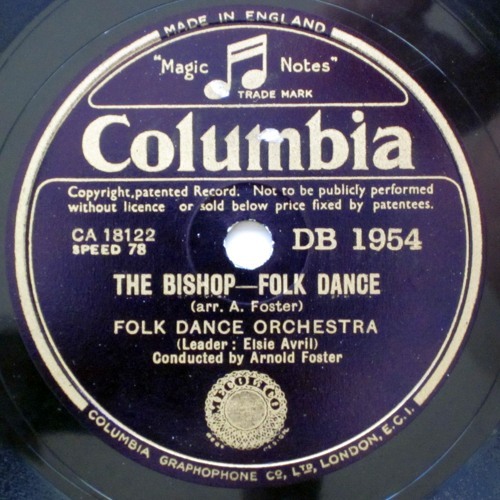 It should be noted that although this 78rpm recording is labelled as "The Bishop - Folk Dance", the tune being played is "Miss Dolland's Delight" which became associated with this dance in the 20th century. equalization & extension of duration. Most 78rpm records are 10 inches in diameter, although some 12" diameter records were issued. 10" records have a running time of a few seconds over 3 minutes on each side. This means the number of repeats of a tune that it is possible to fit into one track is limited. The following example has only 5x32 bars and lasts 3 minutes & 5 seconds. 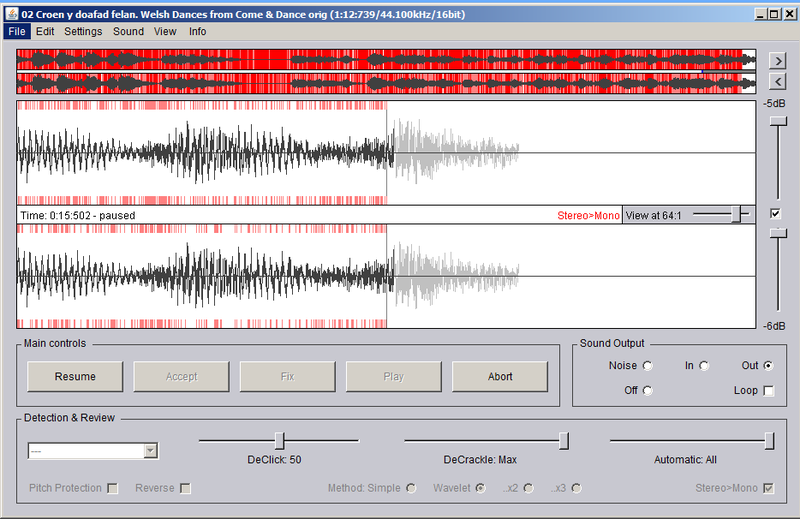 A technique to extend the duration of a folk dance track using Audacity is given in one of the sections on audio processing. This method has been applied (following the usual clean-up of the sound quality described above) to extend this track to 7x32 bars. Note the illustrious make-up of this band including Nan Fleming-Williams, Douglas Kennedy, and Pat Shaw. Although the methods applied have dealt quite well with a number of deficiencies typically found when reproducing tracks from 78rpm records, there will be other types of damage and distortion, such as that mentioned above, that can not be addressed by the set of software tools that have been discussed. 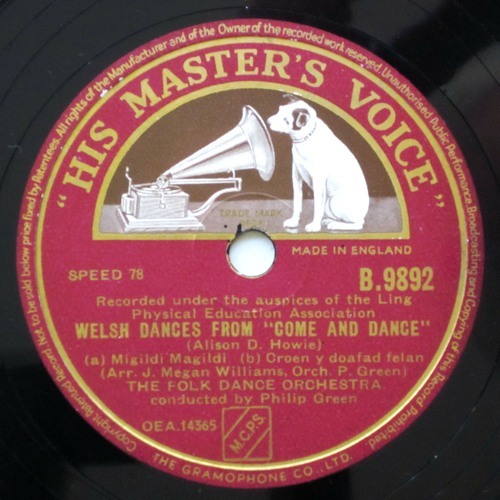 I believe the tools that have been demonstrated here can often produce results that make recordings usable for folk dancing without having to make any allowances for their origin on 78rpm records.